Browse : Home SEO Why Is SEO Marketing A Psychological Process? 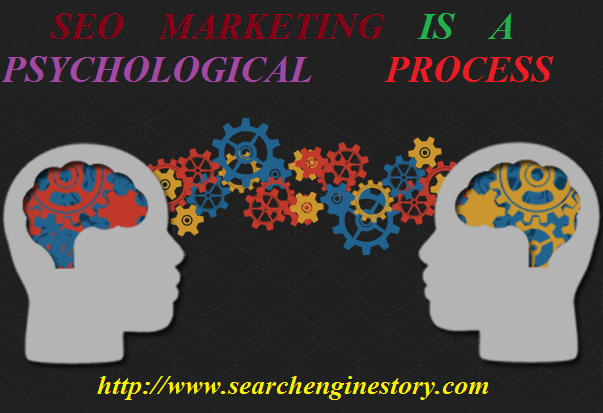 Why Is SEO Marketing A Psychological Process? With the help of the right Search Engine Optimization techniques innumerable online companies have tasted success and continue to do so. Can SEO really help your business entity to get that much needed visibility that is so very important to survive virtually? The answer is a “yes” and a “no”. Why is it so?This is because if you are lucky enough to have an excellent SEO marketing company that has taken the responsibility to take your business to the zenith of its glory, your task is easy. However, there are times when you as an entrepreneur are not able to select the right SEO company to promote your business online and this is when the trouble starts. So, depending on your ability to hire the right SEO firm, work out the accurate and appropriate SEO strategies, your success is determined. However, this article is not about how to select the right SEO firm, instead it deals with an interesting aspect and that is the psychological journey of an entrepreneur and SEO firm all along, from the time the SEO firm gets hired to the time the business entity finds itself on the top-ranking position. So, let us delve deeper into these aspects. For every online business, SEO is indispensable.If you are an SEO professional, you must assist business owners to adopt the right working methods and if you are a business owner, you must understand the minds of your clients and prospective customers (new and existing). So, let’s delve deeper into these aspects. Every step or measure you take, regardless of whether you are the assisting the business entity or you are the owner, these following aspects are required to be addressed, which are undoubtedly the psychological sides of any e-commerce business. When you are offering services and products, you should know your prospective customers, their age group, their interests, how will you make your products appealing, what will appeal to them, and most importantly, how will they benefit from your business. So, all these have a psychological reasoning that you must take in your stride. In the yesteryears, understanding customer behavior mainly revolved around incorporating those words (rather keywords and key phrases) that were searched by users in search engines. Consequently, content would be developed in accordance. However, that didn’t go too far. These days, the search engine algorithms are designed in such a way that will enable you to understand the intention of a visitor. As such, with this magic wand in hand, you can tap the finer aspects of SEO to the fullest. If you are helping a business owner to succeed in his online business as an SEO professional, it is quite likely that the owner does not have any idea about SEO and its various aspects and how it works. So, he is depending on you not just emotionally but also financially assuming that you are his business oar. As a reliable SEO professional/firm, it is your responsibility not to take advantage of this entrepreneur that is banking upon you for his success and most importantly his Return on Investment, which is an integral part of any business. So, be an “oar” in the true sense. Last but not the least, regardless of whether you are an entrepreneur trying to read user’s mind or an SEO firm/professional trying to work out strategies after knowing your client base, you must put yourself in the shoes of your users/clients to know what you ought to cater to from the business point of view.